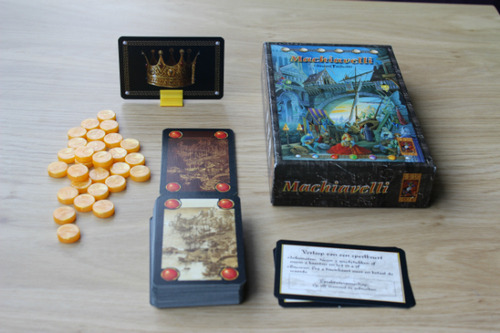 Machiavelli: That's the Dutch version of citadels, is a card game to be precise. 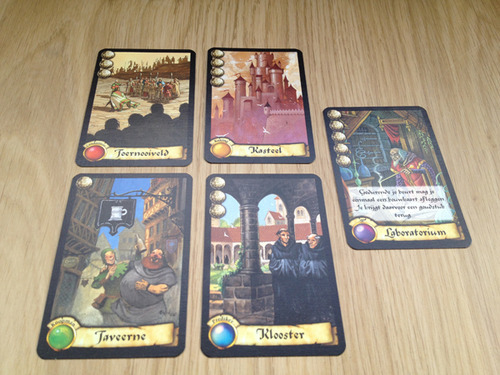 A card game with a medieval setting. You have to try and build 8 as valuable as possible buildings. The value and cost of a building are almost always identical, only for a few cards are an exception. For this review, it's played with 2 people. So my explanation is also based on that fact. Each character card has a different ability that you can use when you posses that specific card. - Assassin: Kills off another character. He just has to say which character he kills.This is where the gambling steps in. Since that character has to keep still and pass it's turn when it's up. So you will not know if your opponent actually has that character until the end of the round. - Thief: Steals from another character. So that means it's a gamble too.The only difference here is that when it is that characters turn, he has to give up all the coins he owns to the thief, at the start of that turn. - Magician: Is allowed to trade all his building cards at hand with those of another player. Even if the Magician has 0 cards! Or he can choose to switch a few building cards with fresh ones. (The amount has to stay the same.) 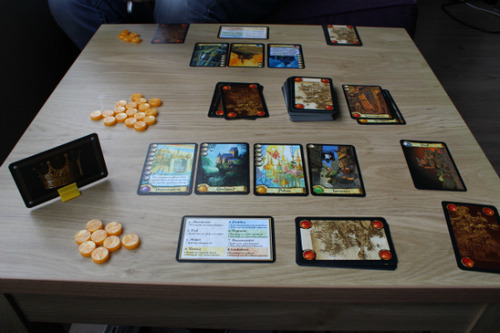 - King: Starts the next round and collects coins from monuments. - Bishop: Is protected against the warlord and collects from religious buildings. - Merchant: Collects an extra coin at the start of the turn and collects coins from every commercial building. - Architect: takes 2 extra building cards. Is allowed to build 3 buildings. - Warlord: Destroys other players buildings. And collects from the military buildings. 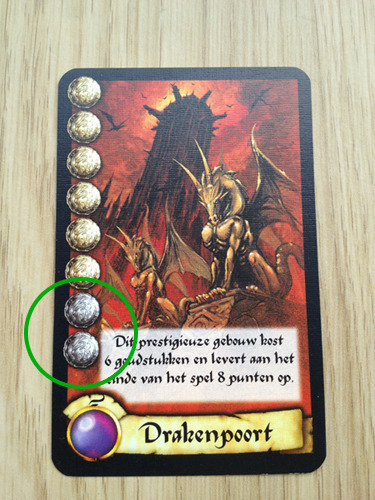 Each coloured circle on the building cards is linked to a character card, except purple. (Like the example on the picture above). 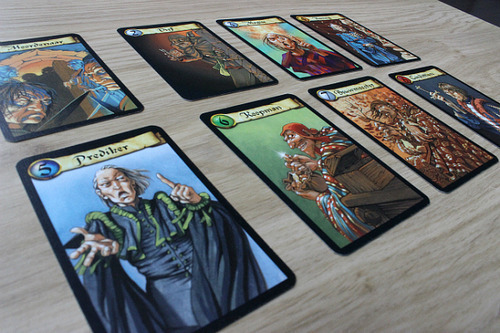 But some character cards have a gray circle, that means there are no buildings connected to it. Also no extra coins per building. There are 5 different types of buildings. 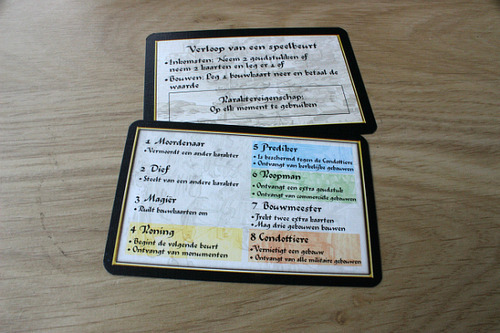 Like mentioned in the previous paragraph, you can recognise them by the coloured circles on the cards. The purple circled cards are special, They always have an advantage (described on the cards) that you can use during the game. Now, if you look close to the building cards,you'll see that there are amounts of coins on each card. Those amounts are the cost for that specific building AND also their value in points. But there's an exception. 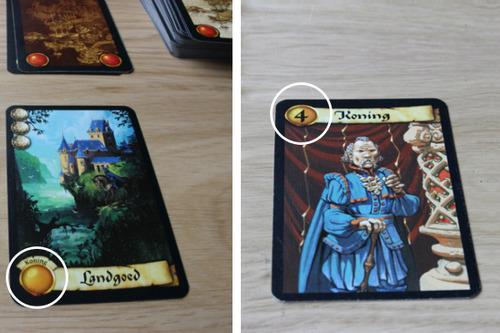 (See the card below) Some building cards show a slightly different color of coins under the row of bronze coins. This means you have to pay the amount of 6 bronze coins, but the card has a value of 8 points at the end of the game. This is just one of the advantages that the purple buildings offer. Just to be clear about building. 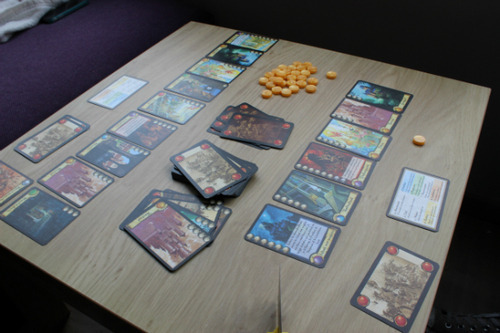 Each player is allowed to build just one building during each turn, except if one plays the architect. He has the ability to build maximum 3 buildings. 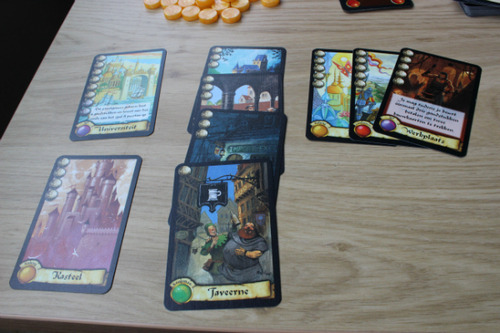 Each player starts with 2 gold coins and 4 random building cards. 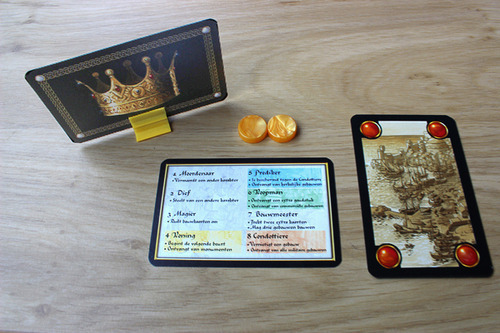 The king starts with shuffling the character cards. He must take the first one off and take a look at it. 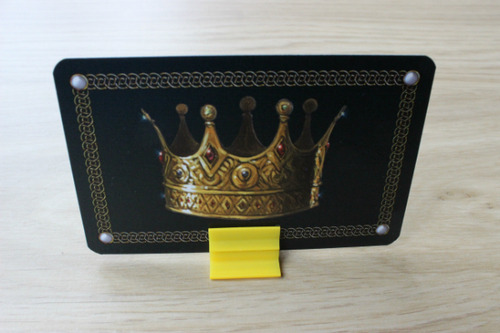 Then put that card facedown in the middle of the table and pass the remaining cards to the other player. If you play with more than 2 players this part is slightly different. Now the king has to call out the characters in the right sequence. When one of the players has the called character, that player's turn starts. this also means that you have to put one back at the bottom of the building card deck. And in a turn you can use the earlier mentioned: character's ability. So for example when it's the merchant's turn: you get an extra gold coin. Then you can build if you want to. At the end of the turn you get a gold coin for every building you've build, that has a green circle on it. (1 coin per building). If all the character cards are called then that round ends. Finally if a player has build 8 buildings, the last round is being played. + 2 points for each player that also reaches 8 buildings after the last round. Coins and buildings that aren't build don't deliver points. Let's use the image above as reference. I grouped the cards to make it easier to count. from left to right: 8 + 4 + 3 + 3 + 3 + 1 + 5 + 5 + 5 = 37 points. 41 + 3 = 44 points And that is the final score. 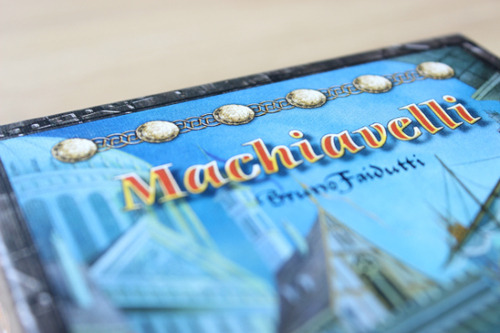 Machiavelli is a fun card game that can be played with 2 to 7 players. It's easy to take along when you're on holiday or just hanging out somewhere with friends. This game is also fairly easy to learn. So you can get started pretty quickly. Another plus is that there's an expansion pack called The Dark City. It includes 15 new building cards and 10 new character cards. This expansion makes the game playable from 2 to 8 players!